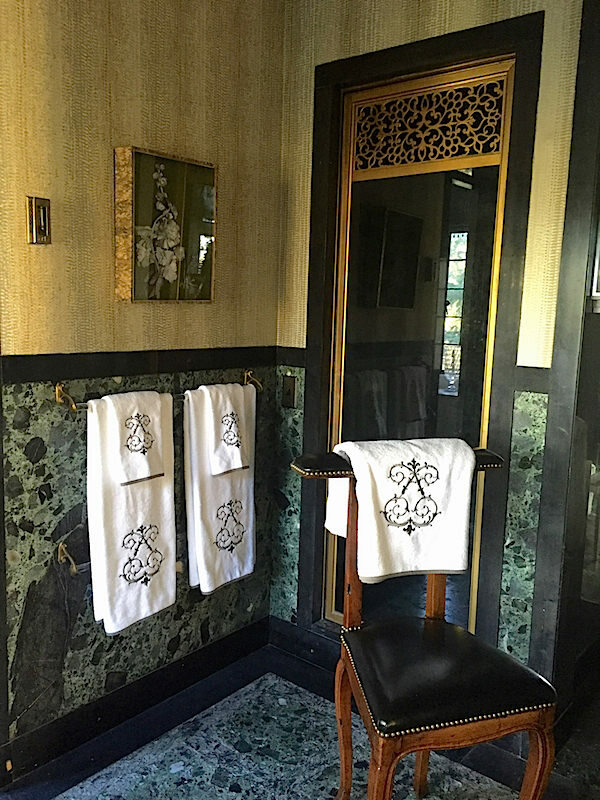 While Nina Campbell‘s vision for the Mr. Doheny Suite at Greystone Mansion was certainly befitting a successful captain of industry, it is not without her signature sense of wit. 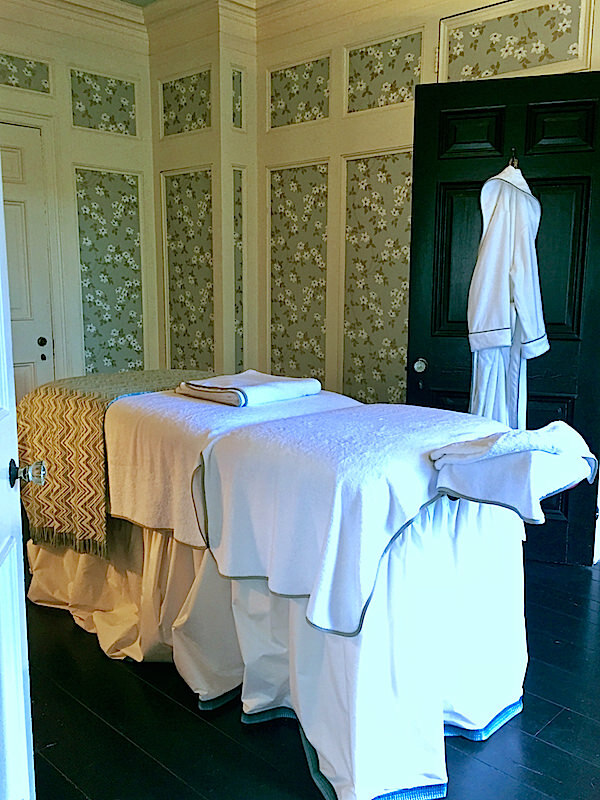 In creating a “haven away from the hassle of everyday life,” Nina transformed an adjoining space into a private massage room. Because who needs a closet or dressing room when you could segué from a hard day at your desk to this relaxing retreat? The soothing pale palette from the bedroom continues with Nina’s Montacute wallpaper for Osborn & Little and Holland & Sherry terry cloth dressing the massage table. But as Nina says, “Doesn’t everyone need a martini after a massage?” so in the back is Soane’s elegant Nuryev Trolley with a Rita Konig lacquer tray, Asprey decanters and martini glasses from Dragonette. Shedding light on the situation is Christopher Spitzmiller’s Wide Zig Zag lamp in my favorite peacock shade, sitting in front of Oomph’s square Newport mirror. In between the massage room and the bedroom is the bath. With many of the original features, it is a luxurious space. With the resurgence of brass and gold tones in fixtures and trim, it feels amazingly on target for today. In the foreground is Nina’s “What Not” for Oomph – a handy and handsome storage or display piece for almost any room. 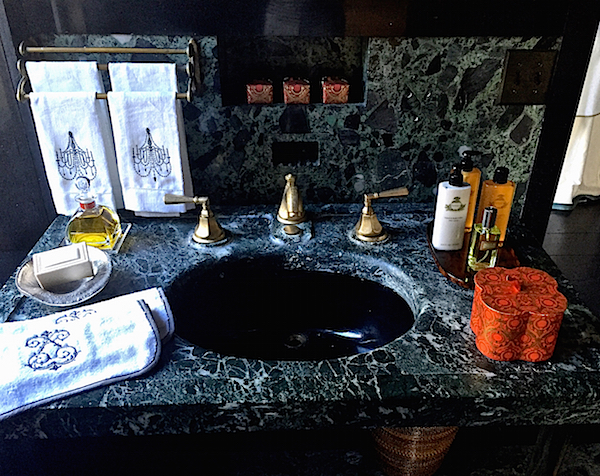 The dark green marble and masculine features are offset by Nina’s elegant crested Heritage towel collection for Stein Mart and the Scanlon Apparati shadow boxes with hand made paper flowers, based on the Florilegium of Alexander Marshal. And for a full sensory experience, wafting through the space is the scent of candles, pot pourri and bath products from Agraria Home. I’d say Nina’s Mr. Doheny Suite is the perfect setting for the modern incarnation of a very lucky man. This entry posted in interior design. 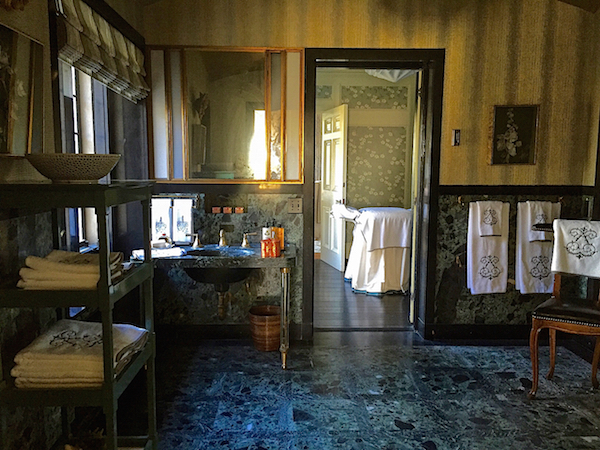 Entry Tags: designer showhouse, Greystone Mansion, interior design, Maison de Luxe, Nina Campbell Bookmark the permalink. Stellar post SB! Love the images. Pinning away! Always enjoy your coverage. Especially enjoyed this peak into Ms. Campbell’s beautiful creation. Thank you. Nina is really a master at the sublime. 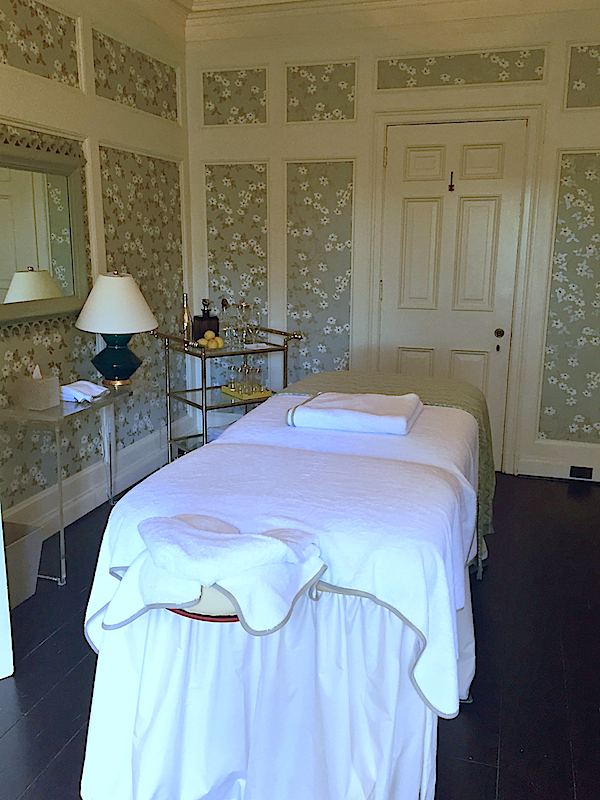 I would love a massage room like this! 80 queries in 1.883 seconds.